Center Stage is a franchise that has somehow stayed alive, despite the mediocrity of the original movie. As far as dance films go, these have always been a bit more sophisticated than the Step-Up films, though this latest sequel begins the inclusion of contemporary dance styles. The original film also featured some truly impressive dancing because of the casting of dancers over actors. 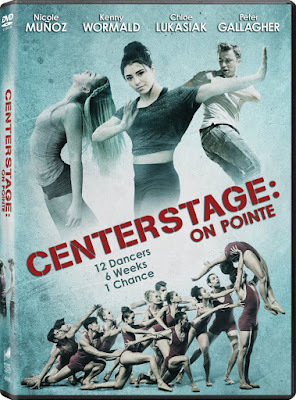 While Center Stage: On Pointe has learned from this tactic by casting actual actors, making for far better scenes of dialogue, it also means that the dancing is far less impressive to watch. Although the Center Stage franchise has kept some of the same characters around in the roles of the teachers, the main connection in this film ties the narrative to the previous sequel far more than the original film. Continuing the storyline of dancers at the prestigious American Ballet Academy, this time we follow the path of Bella Parker (Nicole Muñoz), younger sister to the last sequel’s protagonist. Bella joins the program with the decision by Jonathan Reeves (Peter Gallagher) to integrate modern dance into the curriculum. Before she can be accepted, Bella must compete at a training camp alongside a group of traditional ballet dancers and other untraditional applicants. The new group of hopeful recruits is taught by the characters from the first film returning as choreographers. This includes Charlie (Sascha Radetsky), Cooper (Ethan Stiefel), and Tommy (Kenny Wormald), who each get their chance for brief dance sequences.